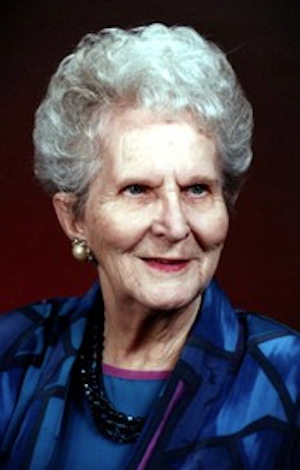 Obituary – Lohec, Mildred Anne (Walker) « Perry High School Alumni Association, Inc.
– daughter of Mr. and Mrs. H. R. Walker, was born August 20, 1919, in Perry, Oklahoma. She has attended the Perry elementary and high school. While a student in Perry she was a member of the Girl Reserve. Following graduation she expects to take a post-graduate course. She is interested in secretarial work. Mildred Anne Lohec, beloved mother and grandmother, went home to be with her Savior on June 3rd, 2009. She was born in Perry, Oklahoma on August 20, 1919. After graduation from business school, she and a friend went to Galveston, Texas on vacation, where she met her future husband, Harrold Phillips. She spent most of her adult life in the Texas City/Galveston area. Here, she survived her husband’s death, when their son Larry was just 3, and later married Sante Fe resident, Joseph Lohec, and had her second son, Jay. In 1992, she moved to Pearland to be near Larry and his family. She was a long time member of the First Presbyterian church of Texas City, but quickly became a treasured member of Cokesbury United Methodist Church. Here she was part of the “Friendly Folks” seniors group, the UMW, the Good News Sunday School class and the Red Hat society. She was the kind of Christian we all aspire to be – loving and kind, and always seeing the best in everyone. We know God is happy to have her home, but we will miss her pure loving, spirit. She is preceded in death by her husband Joseph Lohec, father and mother, Harold and Lina Walker, brother and sister, Wayne and Rosamond Walker, and her son Joseph “Jay” Lohec, Jr. She survived by her son Harrold Laurence “Larry” Lohec and daughter-in-law, Amanda her three granddaughters Susan Bailey and husband Shawn, Heather Nugent and husband Lee, and Savannah Rosamond Lohec; along with 4 great-grandchildren Ashton and Tyler Bailey, Jackson and Andrew Nugent. The visitation will be at Crowder Funeral Home, 2422 Broadway, Pearland, Texas, on Sunday, June 7th from 4 to 8 p.m. The funeral will be held at Cokesbury United Methodist Church, 10030 Scarsdale, Houston, 77089 on Monday, June 8th at 2:30 p.m. with burial to follow at Hayes Grace Memorial Park, Hitchcock, TX. For those desiring, in lieu of flowers, memorials may be given in her name to the Salvation Army or Cokesbury United Methodist Church.